Whatever your boots, make sure they are maintained. After playing, remove all mud and wipe them clean with warm water. Always let the boots dry naturally, with newspaper stuffed inside to help absorb the water and keep the shape of the boot. Putting them on a radiator or in an airing cupboard will dry them far too quickly, cracking the leather, and making them hard and uncomfortable to wear. After the boots are dry, a light polish and buff can be added to bring them back to their best. If changing or cleaning studs, add a slight lubricant to the stud thread to prevent any rusting if moisture gets in. Ensure the stud is tight, but not too tight to damage the thread. (Too much lubricant will reduce the friction and prevent the stud from properly tightening). 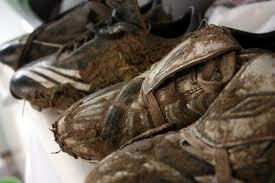 Always try to put your boots on, either in the dressing room or at pitch-side. Walking across car parks or on concrete paths will damage the soles and sharpen the studs or blades which can lead to injury. It is important to check your soles on a regular basis.